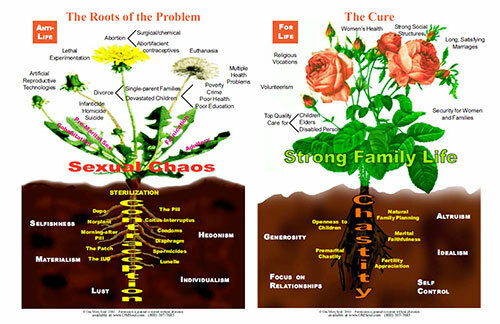 Spreading the Culture of Death seems to be as easy as growing dandelions, while building the Civilization of Love seems to be as tough as growing prize roses. Going the easy way, however, yields very bitter fruit, and taking the more challenging path brings fulfillment of all our best heart’s desires. With these pictures, we at One More Soul are trying to show where the Culture of Death comes from (widespread contraceptive use) and what it will take to promote a healthy society (training ourselves and others in living by chastity). The good news is that this (huge) task is doable–millions of youth are responding eagerly to the message of keeping sexual love for marriage and thousands of couples have turned from contraception to Natural Family Planning or have simply chosen to put their fertility in God’s hands (SuperNatural Family Planning). Knowing where the problem is and what to do about it, we can challenge the current culture, AND WIN!